Sugarplum Style, Vol. 38 | hi Sugarplum! Thanks so much for your excitement over our big makeover reveal yesterday. I can’t wait to share more of the progress, and the final space soon. We’re putting the finishing touches on it now, and fingers-crossed the roman shade arrives in time for their big shoot later this week. 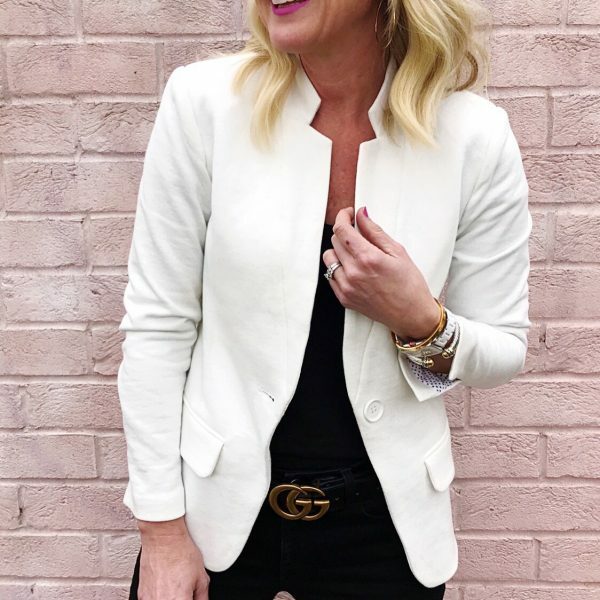 Today it’s time for another Sugarplum Style, snapshots of my everyday outfits I share on Instagram and Facebook, created by mixing and matching items in my closet. My hope is that they inspire you to stretch your wardrobe further by mixing up what you already have, and thoughtfully adding new things. Fit Tip: It runs large, so I’d recommend sizing down. My regular size fits, too, I just usually wear it with a cami because of the v-neck. It’s also long enough for leggings. 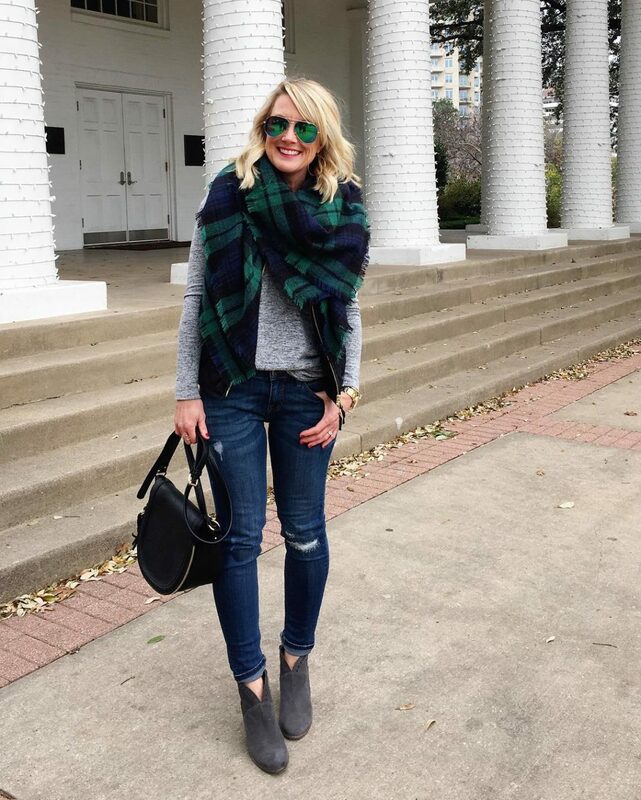 Layered up in my fave $38 peacoat and $25 scarf. 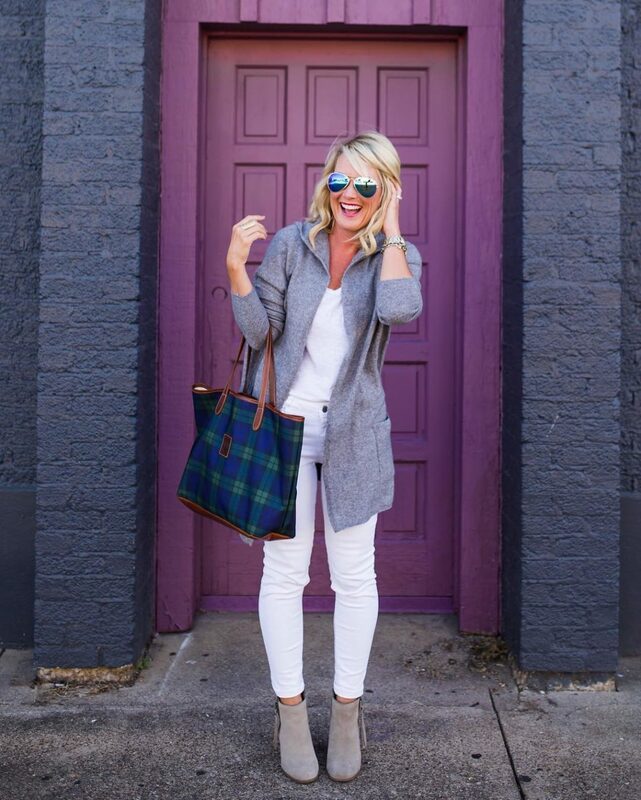 Fit Tip: The coat runs small, so size up! When you go from snow to 70-degrees, only a puffer will do! 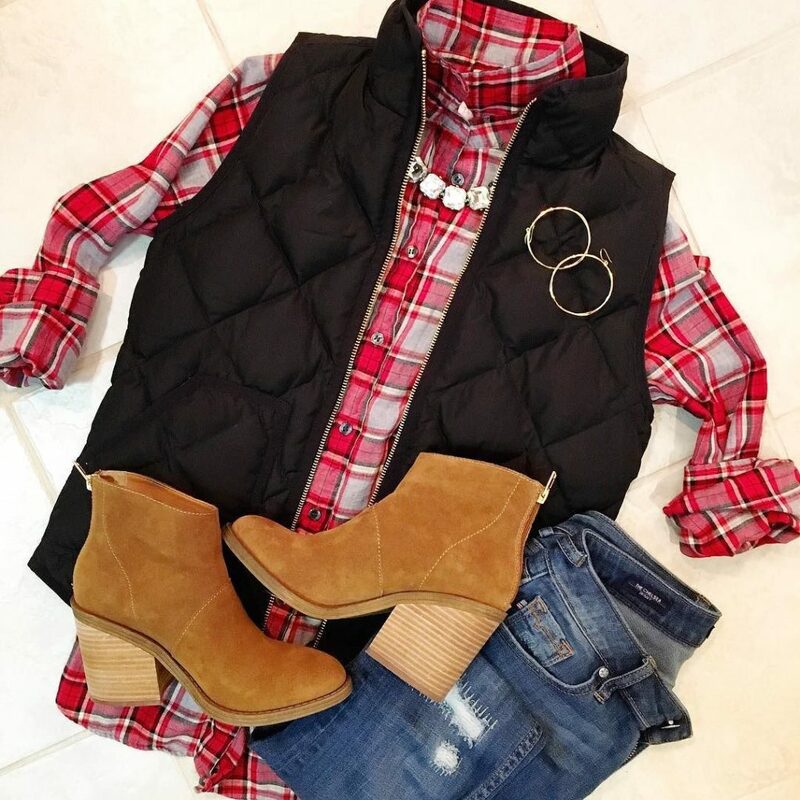 I love to pair some bling with plaid for a more feminine style. 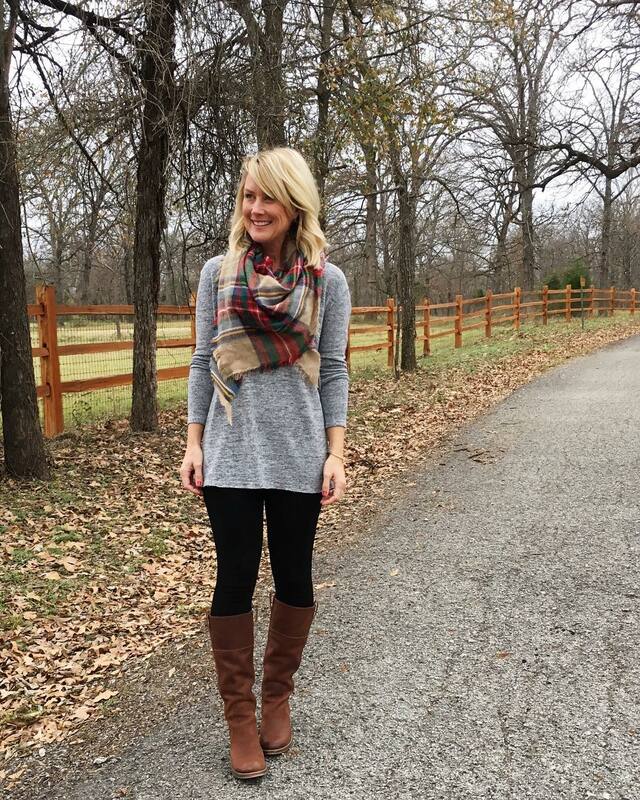 Same cozy top in the first pic, but paired with leggings and boots for a comfy, yet chic, combo. No way my legs are seeing the light of day right now…so I’d add these opaque tights to this combo. 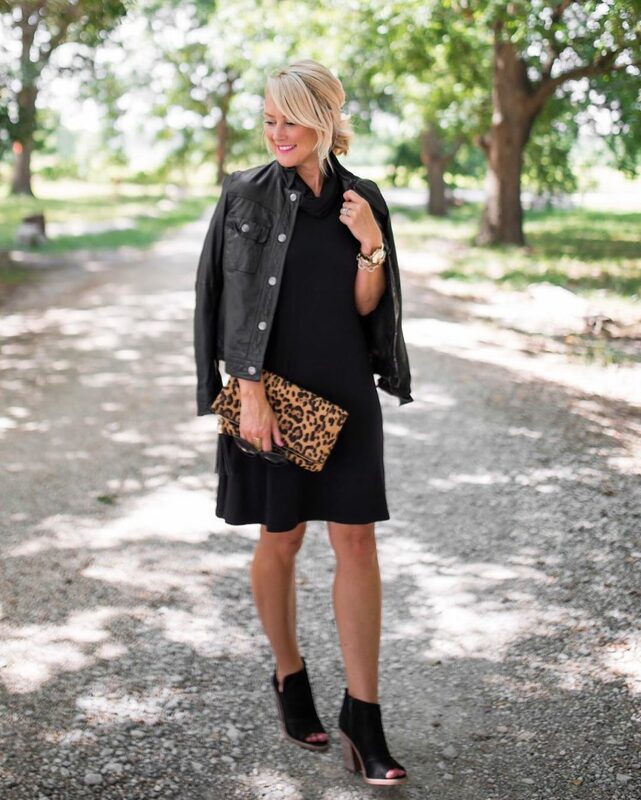 I shared because both the dress and booties are finally on sale! The best part of cold weather? Fair isle sweaters, of course. These booties are cognac perfection, and on sale for under $60, but size up half. 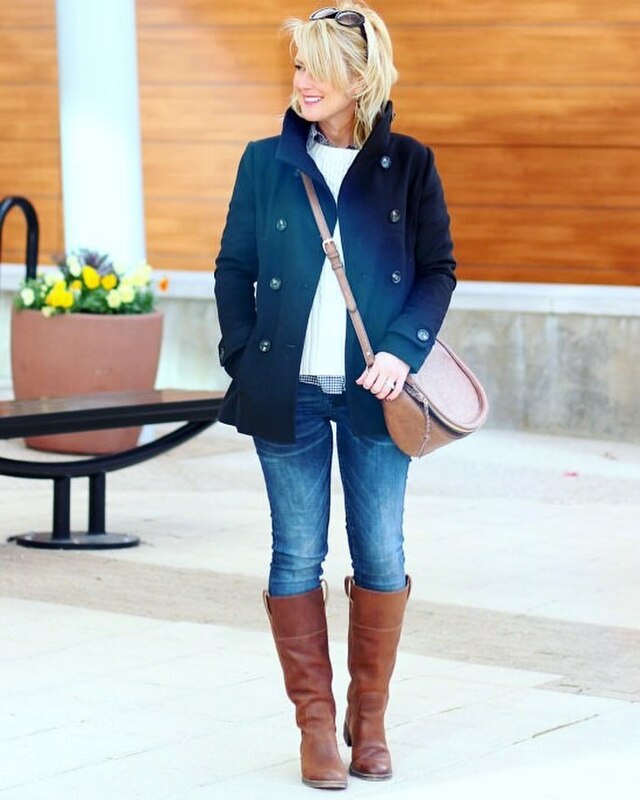 No matter how relaxed my outfit is, throwing on boots and peacoat ups the chic-factor. Oh look, the same sweater top. Again. I should be embarrassed…or maybe I’m just on to something. 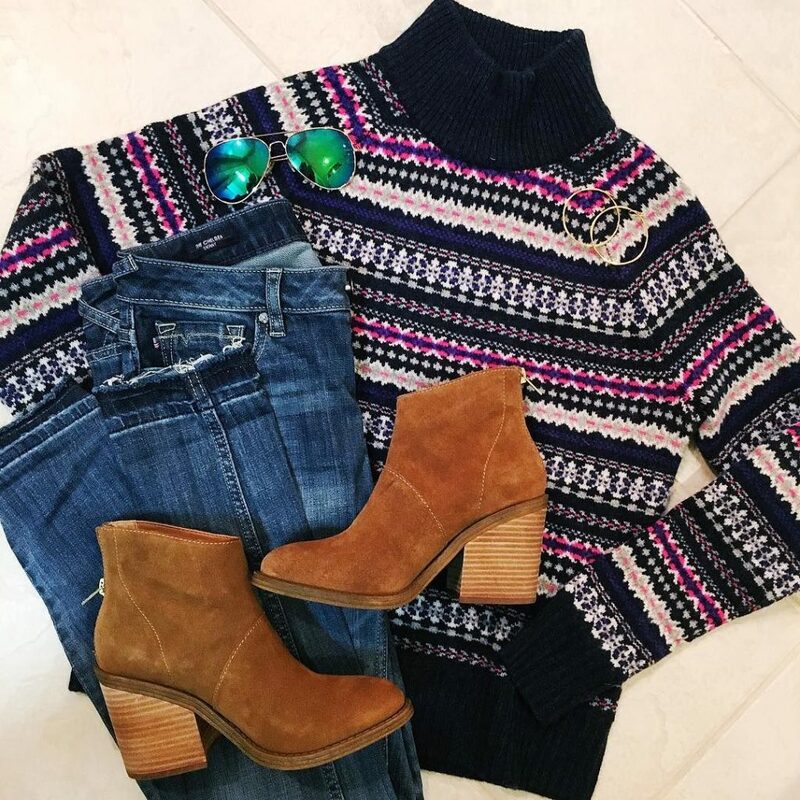 Plus, anything to wear these booties! I call this #momuniform I throw it on for waaaaay too many occasions, but it’s comfortable and always looks pulled together. Sugarplum Tip: This cardi is called ‘Heather Red’ but it’s definitely more pink than red. We had some ‘wintery mix’ blow through a few weekends ago…so I parked myself next to the fire, and stayed in pajamas all day. It was glorious. No question I love my brights, but something about this time of year brings out the neutral-lover in me. 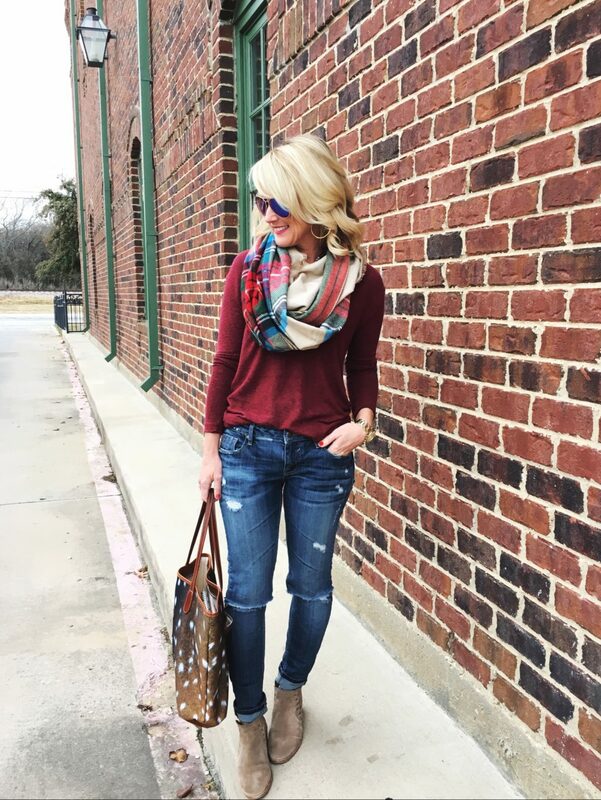 Long cardigans won me over a few months ago…and I especially love them after all the holiday eating! Date night scheming! I love the flattering, shoulder-baring neckline and exposed zipper of this sassy number. It may have not been much, but it was sure pretty watching the snow fall. And cold! Dang, this Texas girl can not hang…I immediately ran back inside! 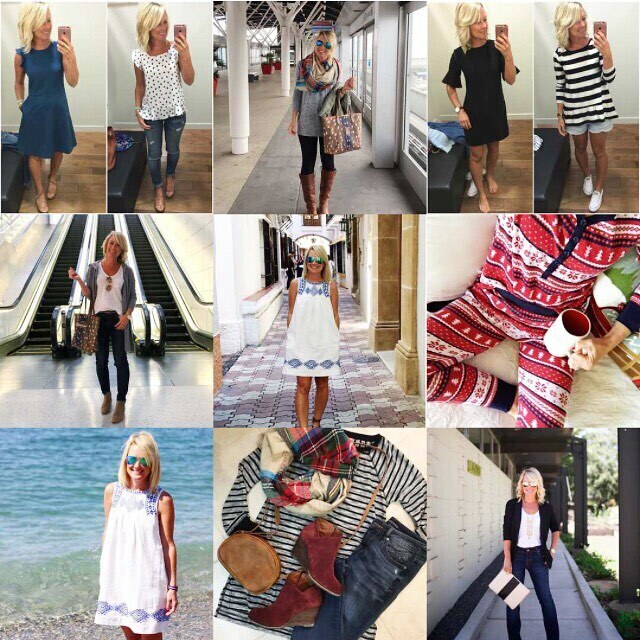 Did ya’ll do a #bestnine on your Instagram? It’s fun to see which images were the most popular…it’s pretty clear what you like to see from me! 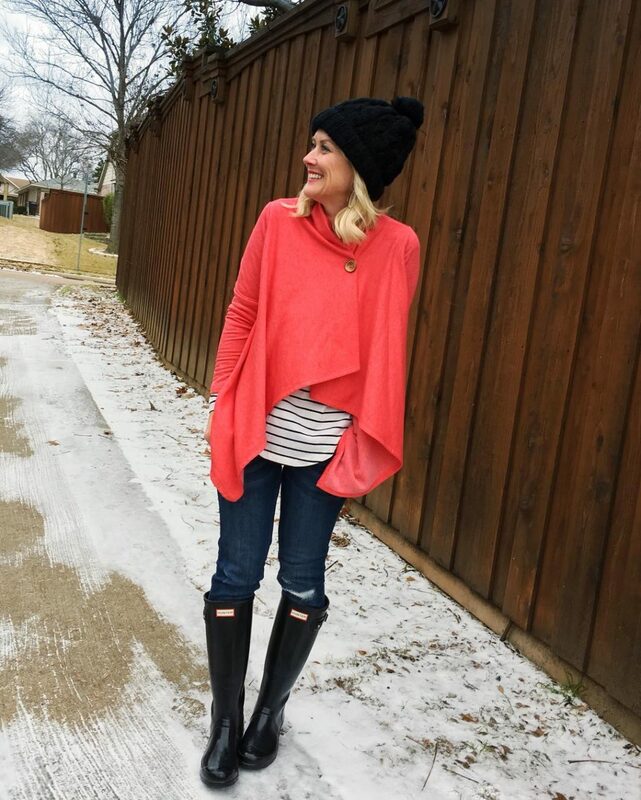 These were all #sugarplumstyle posts…so I’ll keep them coming this year! 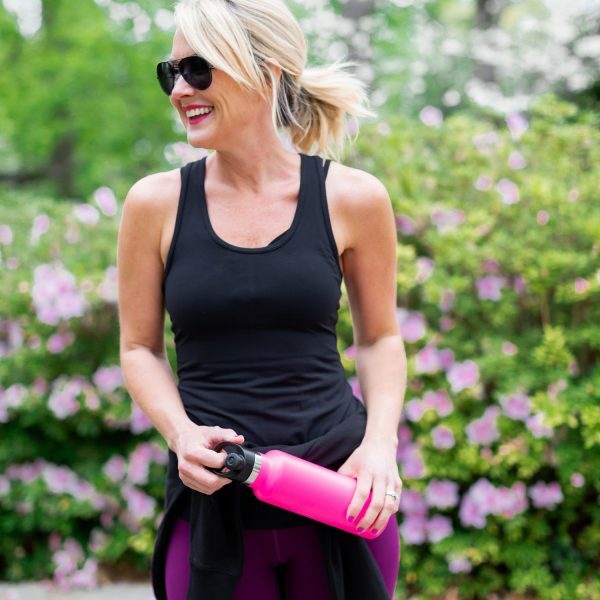 You can catch up with past installments of Sugarplum Style here, or follow my everyday outfits in Instagram. Make sure you’re following my Facebook page too, that’s where I also post deals, steals, sales, and goodies! 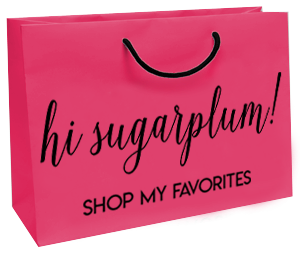 You can also shop my outfits anytime by clicking the #SUGARPLUMSTYLE button under my blog header, or in the Shop menu of the navigation bar. Have a great day, lovebugs! Some of those ig shots in your best 9 have me excited for summer clothes! That embroidered dress was definitely one of my favorites on you in 2016. And you look amazing in those boot cut jeans! Love your style! I have those pink heels and they are surprisingly versatile. A staple in my closet! This is great inspiration as I’m trying to mix things up from my closet this year without adding much to it. Happy Tuesday! I’ve been sale stalking that black/white cheetah scarf for weeks! Fingers crossed it happens at some point! I have to laugh at my self. I follow a Dallas Texas girl to figure out what to wear in Colorado in the winter. Surprisingly it isn’t much different except a couple more layers on a few days. Trying to find a white/ivory shirt with black stripes any ideas? Haven’t had any luck and your link is to a solid. Also have a question about the scarfs you wear. I got a blanket scarf for christmas and love the pattern but have tried it a couple of times and feel like it overwhelms my short frame. Yours don’t seem as bulky. Any suggestion? Last one – heading to Irving in two weeks for my son’s baseball game. Winter (heavy clothes or light layers. Only been later in spring when I consider it warm/hot. Gorgeous!!!! Do you ever wear the same outfit twice! I get exhauuuuuuuusted reading about all your clothes! LOL!!! Your budget sure beats mine! Oh, I get that you reward and mix and match, but, if I am being honest, it all just seems so, so excessive. I love to shop like you do, but when is it enough? 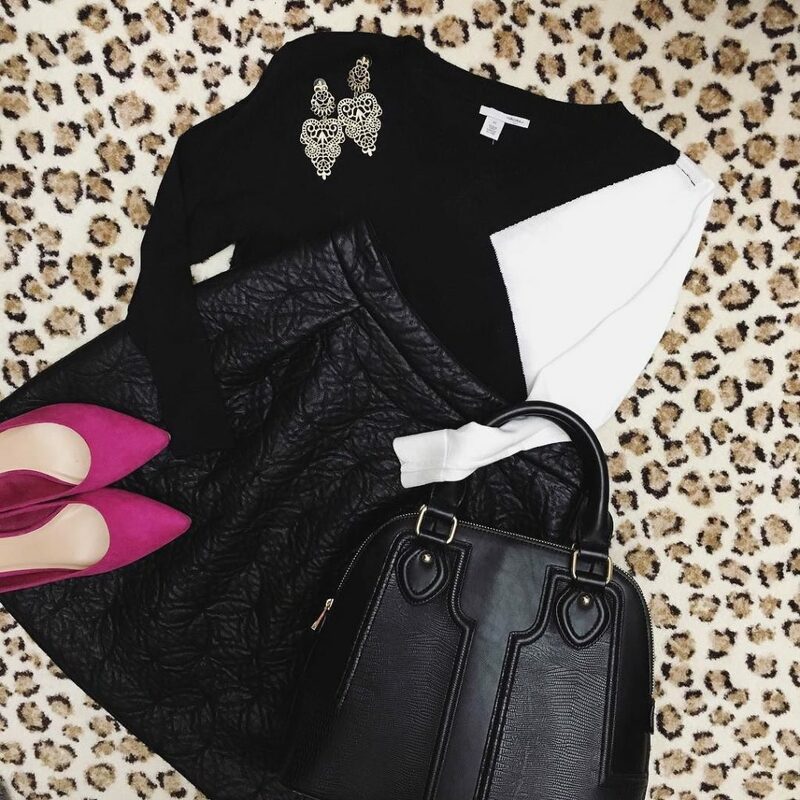 Fashion is part of your brand, but the emphasis on quantity over quality is mind boggling. I do give you credit, you know how to work it. Your sponsors are some good ones, it’s just not my style. 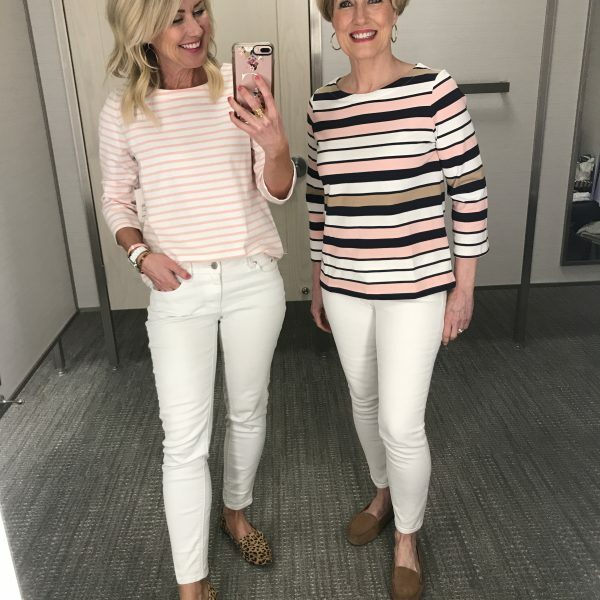 Could you update the link for the tan booties in the pic with the white pants? Love them but the link is pointing to the grey ones in many of the other pics. 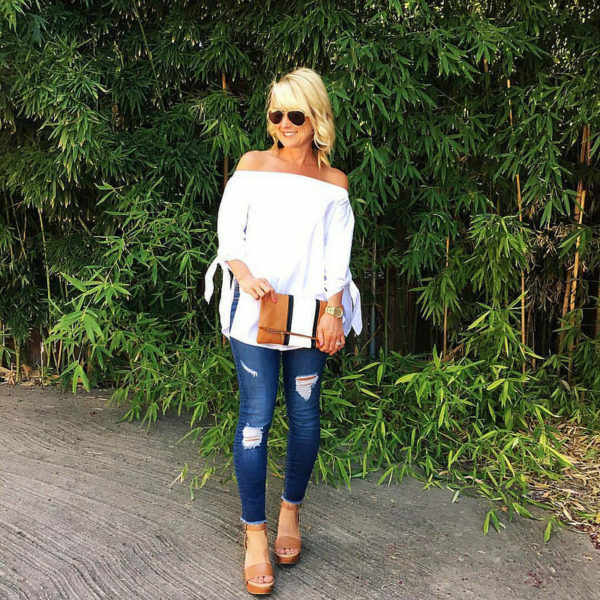 I recently found your blog and love how you are budget friendly and able to make lots of outfits with the same staples. Keep doing what you are doing! 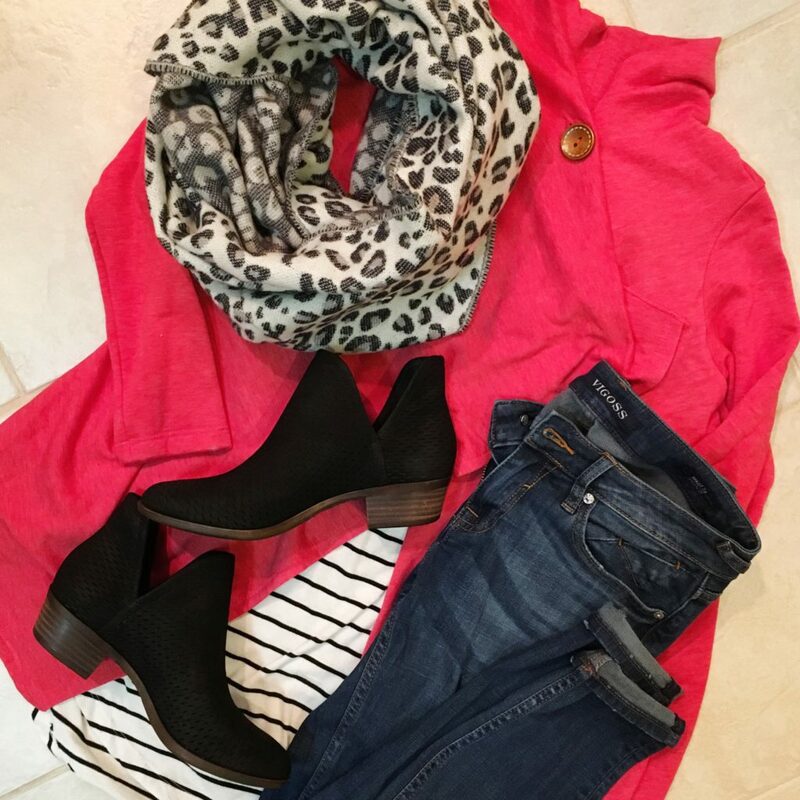 You make it seem so easy to piece together multiple outfits! 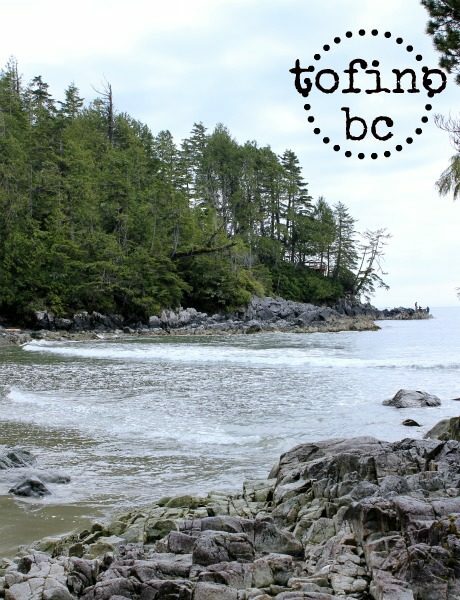 Love your home design blogs, too! 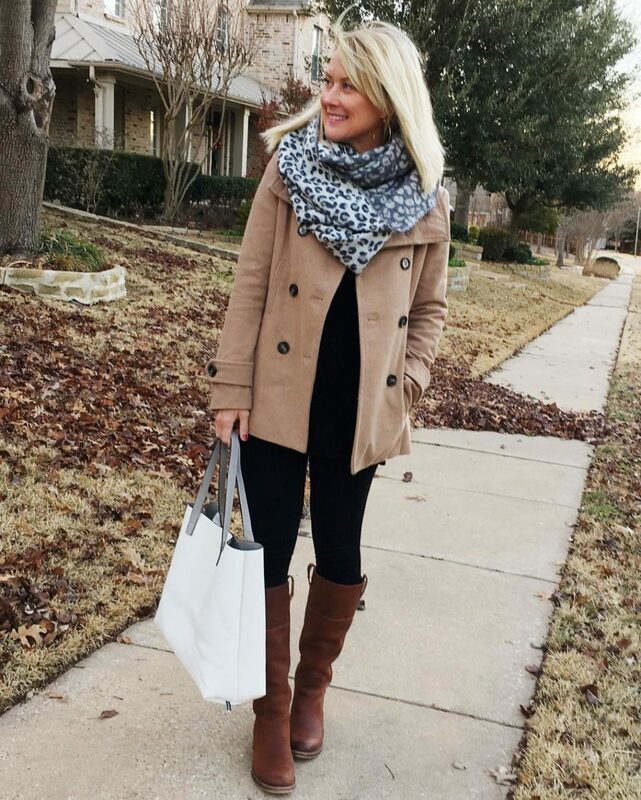 Have you had any size/fit problems with the grey cheetah infinity scarf? I’m seriously considering buying it but the reviews aren’t real favorable on the fit! Thank you! It’s definitely a tighter fit than a traditional blanket scarf…it hugs the neck a bit, so maybe that’s what people don’t like? I often find scarves too baggy/too big so I think this might be a good fit for me. Thank you!